The four-star Novotel Singapore Clarke Quay hotel has upgraded its AV repertoire with a K-array loudspeaker system centred on K Series line arrays. In 2006, the ceiling speaker system was deemed adequate but over time the hotel’s management saw a rising number of clients hiring their own PA systems for live performances at the hotel. This led the hotel to seek a simple, effective FOH system to hire out for live performances in the 525sqm Phoenix Grand Ballroom. It was thought this would alleviate worries of guests and eliminate potential for the hotel to miss out on revenues. For the refit, the hotel enlisted local integrator Concept Systems. The company installed a K-array loudspeaker system supplied by Sennheiser Asia, K-array’s local partner. The K-array loudspeaker solution comprises four wall-mounted KP102 line-array variable beam Python models, powered by KA10-10 amplifiers. Sennheiser Asia supplied the K-array speakers and amplifiers including four KMT12 12in passive subwoofers. 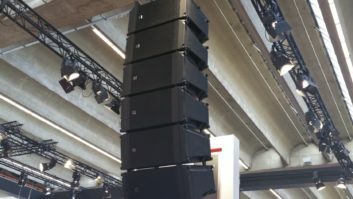 Finished in black, the slim 1.0m long speakers incorporate 12.2in drivers and have been wall mounted to the stage end of the square room facing the 600-capacity audience. The speakers are mixed on one of two newly installed Yamaha LS9-16 consoles, while Sennheiser ew100 wireless microphone options are available including lapel, hand held and head worn condensers. All A/V inputs are controlled via Crestron ST-1700C touch panels interfaced with a programmed Crestron AV2 processor.